Leonard Thedison, age 15, was listening closely. 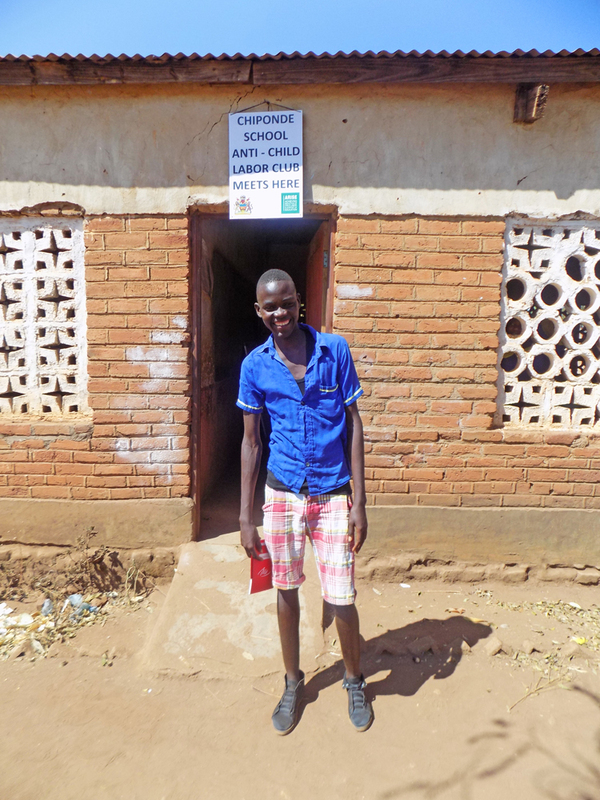 As a member of the anti-child labor club at Chiponde Primary School in the Mchemani Education Zone of Lilongwe Rural East, Malawi, he had already taken to heart the importance of education, how it could create a new life for himself and his family. But today’s topic was about reaching out to others. The students sang, recited poems and talked about how they can help children who have dropped out of school to work. Leonard decided to take action. Although he is only in Grade 7, he resolved to reach out to four children he knew who were not going to school — and talk with their parents, as well. Seventeen-year-old Saukani dropped out of school in 2015 after his parents separated and could no longer support his education. To make money, he graded tobacco and crushed stones. Leonard first met with Saukani, who explained why he was not going to school, and then with Saukani’s parents. He talked to them about children’s rights and the importance of education. Saukani’s parents listened and eventually allowed their son to go back to school. But they still had no money for school supplies. Fortunately, the school had an income-generating activity — a solar-powered barbershop, launched with the support of Winrock’s Achieving Reduction of Child Labor in Support of Education (ARISE) project, funded by JTI.With proceeds from this enterprise, the school provided Saukani with the necessary school materials. “I am glad that I am back in school, thanks to my friend from the anti-child labor club,” says Saukani, who has joined the anti-child labor club, too. Saukani vows to reach out to the parents of children in the same situation that he was. Buoyed by this success, Leonard also talked with the parents of Monica Godfrey, Esinta Chinyama and Loveness Sitafuyele, all of whom had dropped out of school. Once again, Leonard has been successful. All three are back in school and members of the anti-child labor club, too. The solar-powered barber shop is supporting all four with school supplies. Through the ARISE project, Winrock International helped establish anti-child labor clubs in the 18 schools with which it collaborates. These clubs build pupils’ knowledge of child labor and children’s rights. The clubs encourage students to share their knowledge with others and to defend their rights. At present, 421 pupils and 36 teachers are participating in anti-child labor clubs in the 18 ARISE schools. 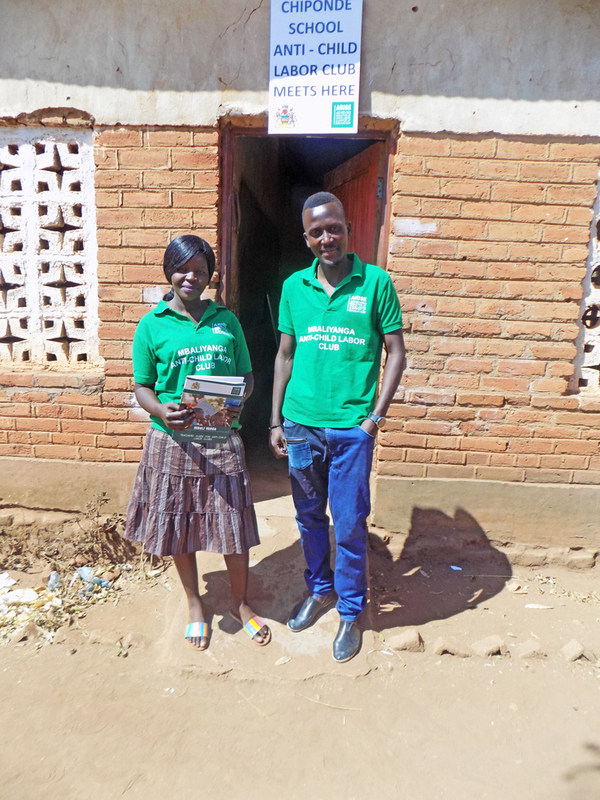 The project has also developed a manual teachers use for this extracurricular activity, and the government in Malawi is planning to pilot it in 13 districts throughout the country with a view to introducing it in all schools eventually. Evelyn Bwanali teaches at Chiponde School and works with the Anti-Child Labor Club there. “What Leonard did is commendable by the school and the community. It is in line with the objectives of the club,” says Evelyn Bwanali, matron for Chiponde Primary School’s anti-child labor club. Leonard is working hard to be selected to a national secondary school when he reaches Grade 8 in 2019. He dreams of becoming a university lecturer someday. In recognition of its anti-child labor clubs and other ARISE youth development activities, Winrock International has been invited by Malawi’s Agricultural Technical and Vocational Training (ATVET) program to join the accreditation committee for agricultural short courses. Winrock will sit on the committee with institutions such as the Lilongwe University of Agriculture and Natural Resources, the National Council on Higher Education and the Ministry of Youth. ATVET is funded by the Comprehensive Africa Agriculture Development Programme (CAADP) and the New Partnership for Africa’s Development (NEPAD) and implemented by the Ministry of Labor and GIZ in collaboration with the Technical Entrepreneurial and Vocational Education and Training Authority (TEVETA).